Brian Paynter is set to become a casualty of Labor’s state election onslaught, while Gembrook MP Brad Battin is likely to retain his seat by a tight margin. The party’s dominance came as a shock, considering Mr Paynter was tipped to narrowly triumph and Mr Battin was expected to steam role candidate Michael Galea. Jordan Crugnale – Bass’s likely new MP – has surged ahead of Mr Paynter by more than 1700 votes, securing 52 per cent of the two candidate party vote. While the Liberal MP has narrowly racked up more primary votes, candidate preferences will likely propel Ms Crugnale into parliament. Ms Crugnale – a former Mayor of Bass Coast Shire – has received a staggering 11.2 per cent swing in her favour. Speaking with the Gazette on Tuesday, Ms Crugnale said she was “beyond thrilled” with the mammoth swing towards her party. “It would be historical to have a Labor member in Bass alongside a Labor Government, for the first time ever,” she said. “The swing has been incredible and it shows that people as a collective have gone with a positive, progressive government. Closer to Officer, and the verdict is not yet set in stone. With little over 60 per cent of the vote counted, incumbent Brad Battin is edging ahead – tipped to retain the electorate. The seat, which was labelled a Liberal stronghold by analysts and bookies, has been brought down to the wire – with Mr Galea and Labor yielding a 5.6 per cent swing in favour. 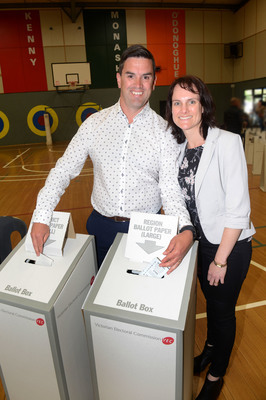 With just three candidates vying for the electorate, Mr Battin garnered more than 50 per cent of first preference votes. However, Greens’ Amy Gregorovich attracted 9.8 per cent of the primary vote – with preferences that will aid Labor. When contacted by the Gazette, Mr Battin said it was still too early to comment on the outcome. “It’s been a very tough weekend,” he said. Win, lose or draw; Mr Galea said he was proud of the result. “I’m proud to call this community my home, and no matter what the result is I’m thrilled to have contributed to making this seat marginal,” he said.